Nancy Lanier '49 devoted her life to living in Mexico and translating the New Testament into two Otomi dialects. Until a few years ago, she used email to oversee work on an Otomi Bible from her home in Tucson, Ariz. "I didn't know I was going to be a Bible translator when I attended Westmont," she says. "But God knew, and he prepared me. I'm grateful for my Bible major." Nancy taught elementary school in Vallejo, California for four years and took a course at Camp Wycliffe one summer after hearing about it from a Westmont friend. "The Lord led me to apply to Wycliffe Bible Translators, and I was accepted," she says. She joined Wycliffe in 1952 and settled in northern Mexico the next year, assigned to the Otomi indigenous group, which includes many thousands of people spread over several states. She began learning the language and working with translators, making her home in an Otomi village in the Mezquital Valley. "We can't do it without the native speakers," she says. "They must do the translation." Nancy helped compile an Otomi dictionary in 1956, and the people received the Otomi New Testament in 1971. Nancy next worked on a translation in a different Otomi dialect spoken in Queretaro, and the people received this second Otomi New Testament in 2003. "I thoroughly enjoyed my experiences," she says. "The Otomi are hospitable, accepting people. I made many friends and still stay in contact with some of them." 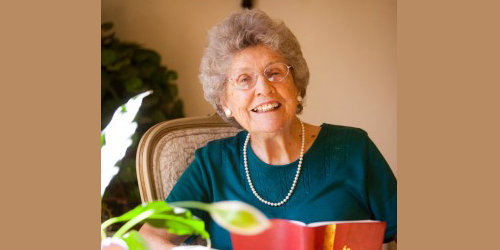 Although Nancy retired after 50 years of work in 2003, she has stayed involved with Wycliffe and lives near the organization's headquarters in Tucson. While she travels less these days, she still exercises and sings in the Vistoso Community Church choir. In 1999, Nancy returned to campus for her 50th college reunion. She adopted advice from former director of gift planning Iva Schatz to invest an inheritance she had received in gift annuities from Westmont. As a result, she became a member of the Wallace Emerson Society. "The gift annuities have been so helpful in providing fixed income for me," she says. "I'm so thankful to the Lord for leading me to Westmont and through Westmont to Wycliffe. I'm grateful to God for all the ways he has led and provided for me." Reproduced with permission from the summer 2012 Westmont College Magazine. For more information about gift annuities and their lifetime income and tax benefits, please contact the Office of Gift Planning at (805) 565-6058 or giftplanning@westmont.edu.